This past Sunday saw me at my favorite wetland pond where a couple of Wood Duck broods spent a successful summer surviving the snapping turtles that dwell in the pond. A high growth of vegetation along the pond’s edge let me set up my scope and camera without disturbing the ducks. 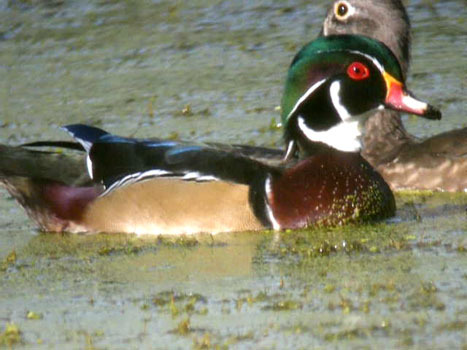 By this time in the year the pond has slimed up with algae yet these ducks keep their vivid colors. An ugly surprise lurks in the pond. 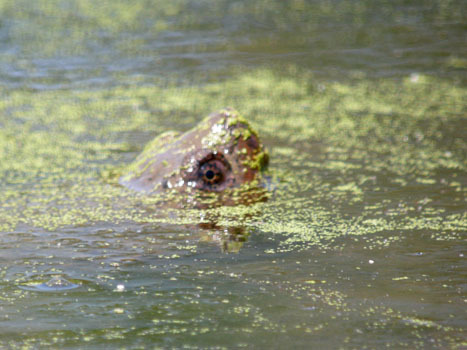 Snapping Turtles are one of the big perils young waterfowl have to avoid. Plenty of these things dwell in this pond. A snapper can pull a full grown Canada Goose down and devour it. They also have amazingly long, longer than you would imagine, necks that can stretch and strike out over their backs. Meanwhile, I put my fixed 30x eyepiece on my scope. I did so upon some advice given in Mike’s Birding and Digiscoping Blog. Previously, I used my 20-60x zoom. Most of the time I kept it wide open, but on occasion, just as many intermediate photographers do, I would zoom in just to see if I could get away with a closer shot. Sure, I got much closer compositions but I paid for it with poor light and blurry shots. I am not sure why a fixed lens of the same magnification would be better than the zoom on that power setting, but I thought I might give it a try. 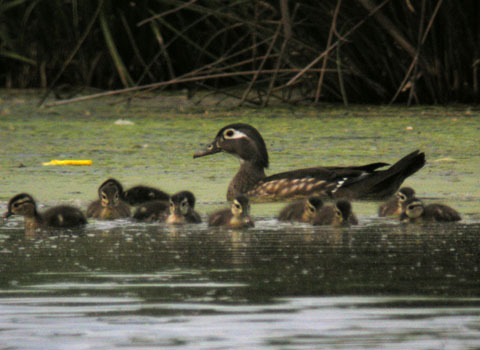 Below is a shot of a brood from earlier this summer when I still had the 20-60x zoom in use. I am still experimenting and will have to do a better comparison, but I feel there is a bit more brightness with the fixed eyepiece as seen in the below shot. The young ducks spent a good deal of time preening (again, all that algae), stretching, flapping their wings and hissing at each other, before finally tucking their heads into their back feathers to nap. 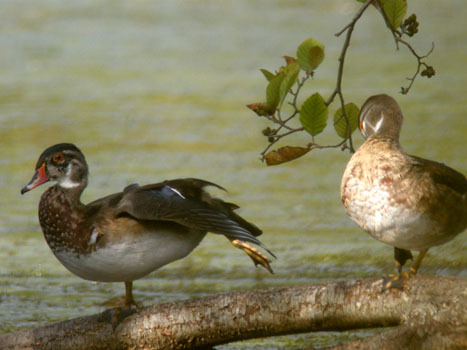 Then a family came down to the pond yelling and excited, and nap time for the Wood Ducks came to an end. The ducks headed for the other side of the pond and I headed for my car.